There are a lot of choices when it comes to kitchen lighting and the most important part of your selection should be the type of light, not necessary the light fixture itself. 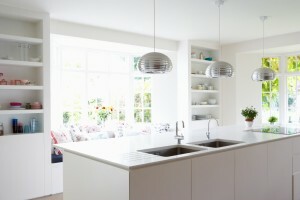 There are 3 types of kitchen lighting that you should be concerned with and you will probably need at least 2 of them. The 3 types are: ambient, task, and accent. Ambient lighting refers to the general lighting of the room. This will be the light most likely hanging or affixed to the ceiling. You want to install task lighting in places where you will be working, such as over kitchen islands, cabinets, and in pantries. The third kind of kitchen lighting is accent lighting, which you may or may not need to use for your kitchen remodel. Accent lighting, just like the name implies, is used to accent or highlight a particular area. Often used to highlight artwork or special collections, like the other types of lighting mentioned, it can be used in the kitchen or any room of the home. Once you decide on the type of lighting your kitchen needs, then you will be able to progress on to the task of choosing the style of lighting fixtures. It’s important to think about the lighting element when you are first planning your kitchen remodel so that you can incorporate the lighting as you go along. For example, if you are installing new cabinetry and elect to install under cabinet task lighting, this is something you will want to plan for at the outset. The same is true for all the lighting you install in your kitchen. It will be far easier to make lighting decisions and plan for the different layers of lighting if you plan for this step at the very beginning of your remodeling job. One way to experiment with different types and styles of kitchen lighting before you begin your remodeling job is to use design software. Design software, which you can purchase or find online for free, allows you to drag and drop different elements of the room you are remodeling to create a virtual room. In this example, you can experiment with different types of cabinets and lighting to see which kind you prefer. You can do the same when you are planning the lighting that will illuminate your kitchen island. Experiment with pendants, track lighting, recessed lighting and different styles of fixtures until you find the one that most fits your overall style. While it’s easy to change out the style of light fixtures, the type requires more complex work so it is imperative that you make the right decisions regarding your kitchen lighting at the beginning of your remodel. Visit local home improvement stores to see the different types of lighting up close so that you can see the difference and choose the best lighting for your kitchen.